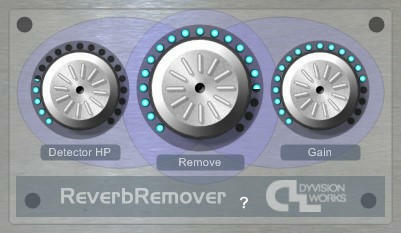 DyVision Reverb Remover from DyVision Works is a 32bit VST effect for use in Windows DAW programs. It can remove reverb from an audio signal, and also has de- essing and background noise reduction capabilities. It is designed to be used as an insert effect on stereo audio signals. DyVision Reverb Remover is NOT a gate or a transient shaper, but employs an entirely new approach to separate and remove reverb and leave you with a cleaner, 'dryer' signal. • Remove the reverb from an audio signal. • Ideal for treating audio recorded in a less-than- perfect acoustic environment (eg. an echoey project studio or when on location) • Unique proprietary algorithms (this is NOT another gate or a transient shaper). • Incredibly simple to get the results you want with intuitive and minimalist controls. • As a side benefit, Dyvision Reverb Remover also helps to de-ess an audio signal and reduce ambient background noise levels. • Download the fully functional demo and test it on your own material. The demo has no time limit but will insert white noise every 30 seconds or so. Purchasing the full version removes this. • Purchase from the link at the top of this page. All purchases are delivered by download link sent to you via e-mail.